Reply 'For Captn. 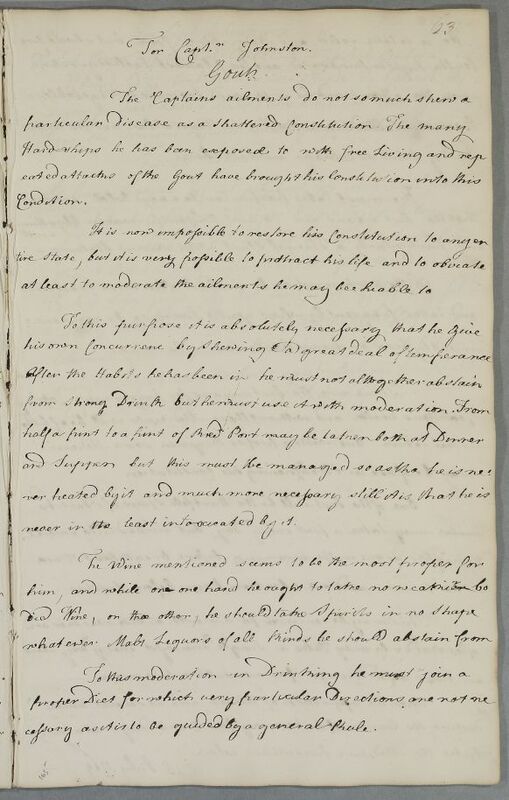 Johnston', prescribing dietary advice for gout, with three recipes for him and his wife. Summary Reply 'For Captn. 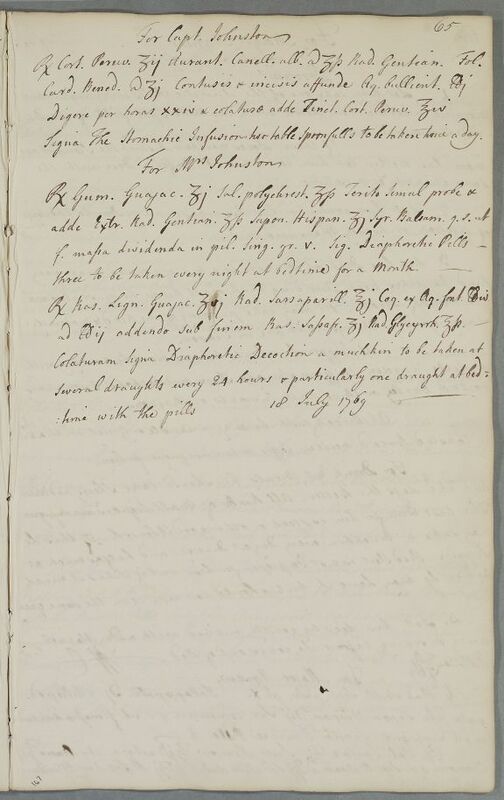 Johnston', prescribing dietary advice for gout, with three recipes for him and his wife. Case of Captain Johnston who is being treated for the gout. 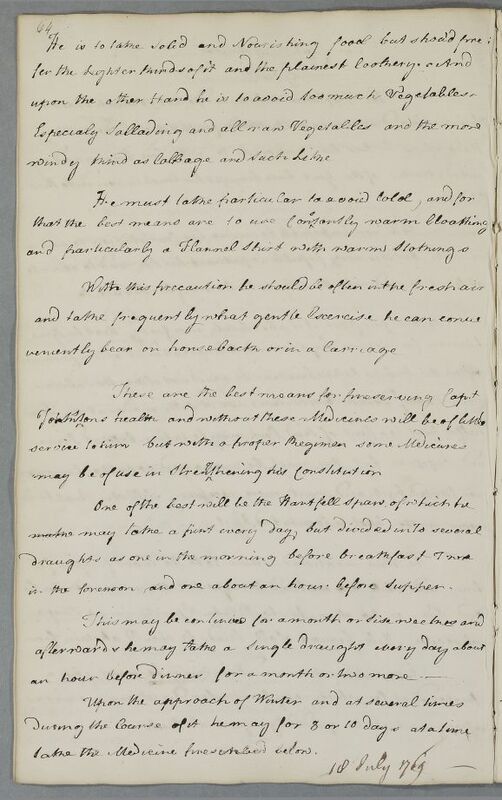 Case of Mrs Johnston who has chronic rheumatism and is prescribed diaphoretics. never in the least intoxicated by it. cessary as it is to be guided by a general Rule. upon the other Hand he is to avoid too much Vegetables. in the forenoon and one about an hour before supper. take the Medicine prescribed below. Take 2 drachms of Peruvian Bark, half an ounce each of orange peel and white cinnamon, one drachm each of gentian root and Blessed Thistle leaf. Having crushed and chopped them, add to a pint of boiling water. Steep for 24 hours and strain, and add 4 ounces of tincture of Peruvian Bark. Label: The Stomachic Infusion two tablespoonfulls to be taken twice a day. Take 1 drachm of Gum Guaiacum, half a drachm of Polychrest salt, and rub together properly and add extract of gentian root, half a drachm of Spanish soap, and one drachm of balsamic syrup, sufficient to make a mass to be divided into five individual pills of a grain each. Label: Diaphoretic Pills – three to be taken every night at bedtime for a month. ℞ Cort. Peruv. ʒii Aurant. Canell. alb. @ ʒſs Rad. Gentian. Fol. Signa The Stomachic Infusion two tablespoonfulls to be taken twice a day.